Today I have something fun to share with you! 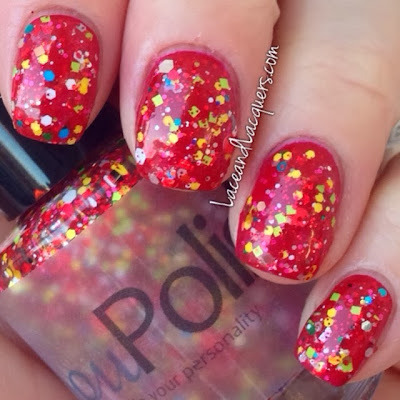 Today marks December 1st, which is also the day You Polish's holiday advent polishes start! I will be bringing you 24 different polishes throughout the month of December. Be sure to tune back here if you're interested in this! I'll have you first look at these polishes as they are released :] If you want to stay up to the minute on when these polishes release, I suggest following You Polish on Facebook. Now... without further adieu! Santa? 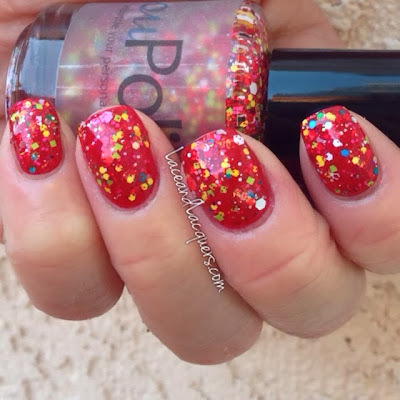 Maybe is the first polish in You Polish's advent! It is a mix of "matte and metallic red hexes, squares and dots with white, silver, purple, blue and bright neon pink, green and yellow". 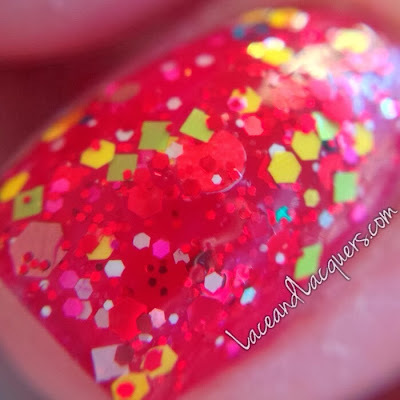 Perfect for the holidays over a red or a green, but still fun enough to wear all year round! I think this embraces the Christmas holiday season perfectly, with red and green and the colors of fun and toys! I did 2 coats over Zoya Rekha, no top coat. It didn't give me any issues with application or dry time. The red dots came out without a problem; I didn't need to fish for them! I freakin' love this polish! It IS one of my favorites out of the 24. "It looks like a Christmas tree!" - Buddy the Elf. 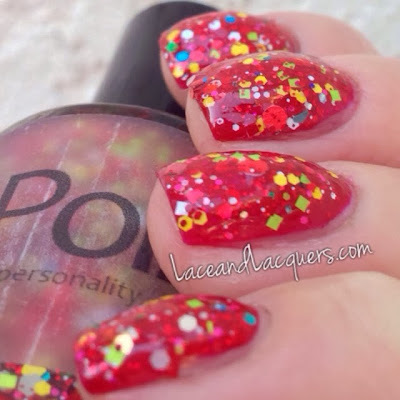 Pretty sure that is the best quote ever to describe this polish. 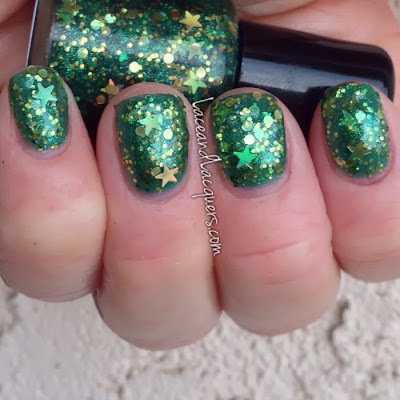 Festivus is a "green tree base with green shimmer containing gold dots, micro glitter and stars". And OH does it shimmer! 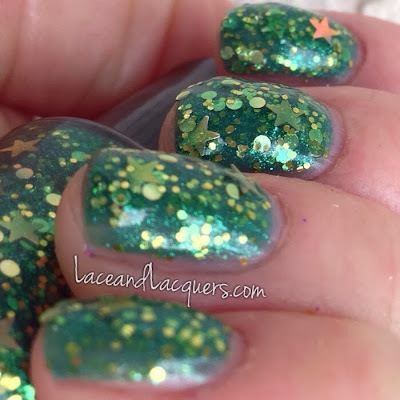 Seriously, if you like green and glitter, buy this polish. 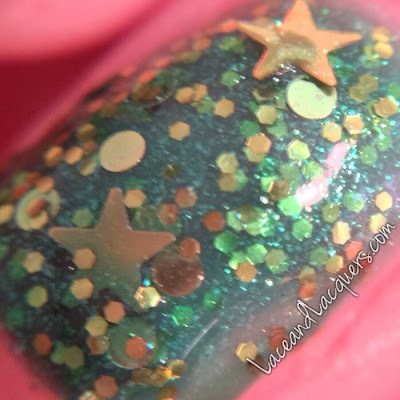 I did 3 coats of Festivus , no undies or top coat. It could be layered over a similar color, but it builds up nicely for that layered effect. It didn't give me any application or dry time issues. No fishing for dots or stars either :] This one was good to go! 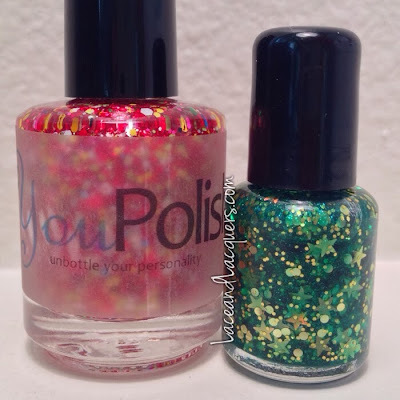 As I said before, these are polishes from You Polish's advent collection. These are days #1 and #2, Santa? Maybe will be released today and Festivus will be released tomorrow, 12/2! Stay tuned to You Polish's social networks to stay up to day for when these release. 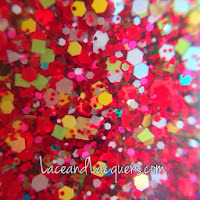 By the way, once these polishes are gone - they're gone! Only a set amount were made. 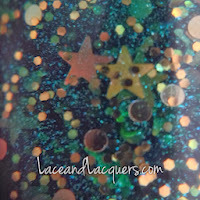 Want to view the advent polishes I've swatched? Check out them out here! Agreed! Both so different and pretty!